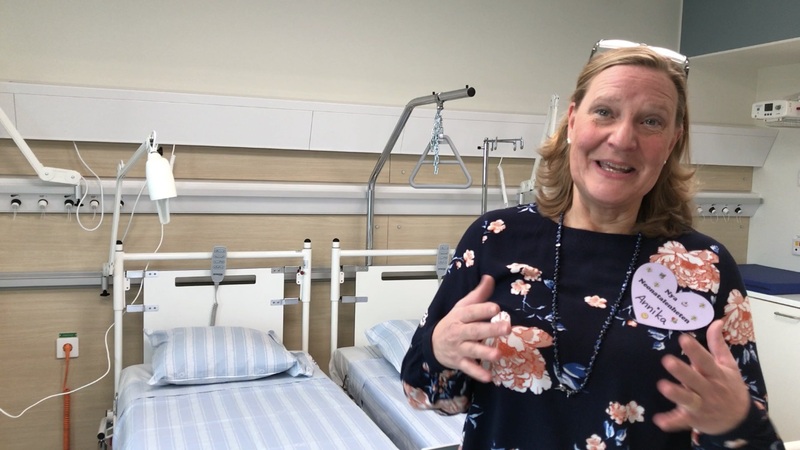 The staff at Helsingborg’s new neonatal unit hope, that their innovative lighting solution will inspire other hospitals to rethink, how light is traditionally used, and how it can play an important part of a healthy development for their patients, as well as supporting the wellbeing of parents and staff themselves. At the inauguration of the newly built neonatal unit, on Friday 16th of September, in Helsingborg, the pioneering lighting solution was at the center of attention among the large crowd of visitors. And although the ceiling lamps seemed inconspicuous, the touch panels on the walls revealed a new feature; the possibility for staff and parents to set the light depending on the situation, with five pre-set light scenarios. General light – Protects the baby’s sensitive eyes in the incubator, while providing a good visibility for staff & parents in the room. Night light – Incubator is dark, navigational light only (equivalent of that of a candle). Mood light – Allows visual intimacy with parents without disrupting the circadian rythme. Observational light – For shorter periods only, when important to interpret the baby’s signals, or monitor. Precision light – For very short period only, requires eye shields, or covering, for babies. Similar levels to that of an office. The starting point for developing the new neonatal lighting solution was the importance of put the needs of the babies first, in line with the NIDCAP program, while also supporting the body’s own biological rythme, for staff and parents. 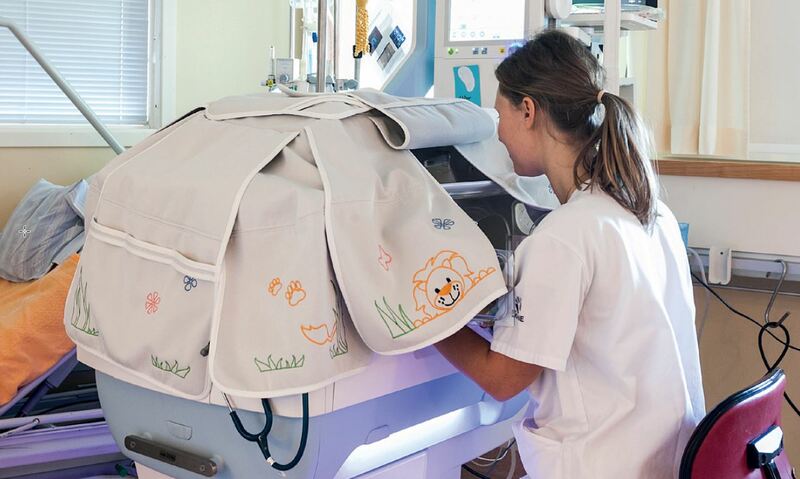 “We hope this lighting project will find its way to other neonatal units in Sweden and beyond, after its been evaluated”, says Annika Rosén, Head of Unit and project manager at Region Skåne. The innovative lighting project was a collaboration between Innovation Skåne, BrainLit, Moum Design, WSP for Region Skåne. If you’re interested in requesting a visit at neonatal, please contact Maria Edgren at Innovation Skåne. 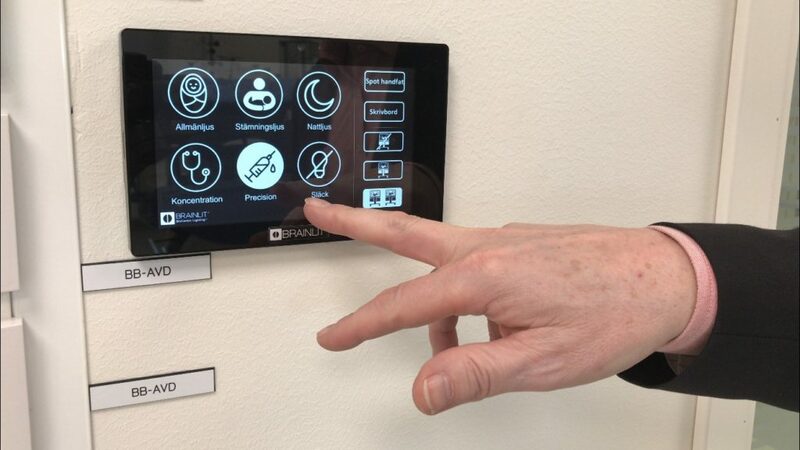 BrainLit’s biocentric touchpanel with the five lighting scenarios. 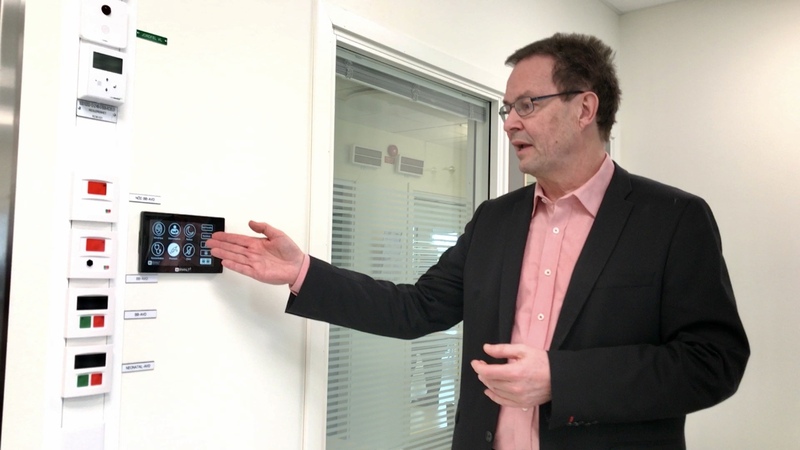 BrainLit’s CEO, Peter Andersson, demonstrates. Annika Rosén, Project Manager and Head of Unit at Region Skåne, hopes the new solution will inspire a new era in neonatal lighting.